coffee fans of all stripes agree: It’s gotta be hot! Sophisticated coffeemakers do everything but scramble eggs these days. But at the very heart of coffee-making appliances are receptacles designed to keep contents at constant temperatures so the flavor isn’t lost. Some are glass. Others are steel. But if you seek a vessel that’s most likely to help maintain that temperature for more than a few minutes, you need to find the best thermal coffee carafe for performance and longevity. Luckily for you, I tried a lot of them: here are my findings! 1 What’s the Best Thermal Coffee Carafe to buy in 2019? 5.1 Did you like my Best Coffee Carafee Guide? What’s the Best Thermal Coffee Carafe to buy in 2019? It’s sleek, tall, and ready to keep your favorite hot beverage at peak temperature until the last drop has been poured. Cresimo internal engineering “locks in temperatures to preserve flavor and freshness” for 12 hours, but if you use it for cold beverages, temperature holds time doubles to 24-hours because the double-walled interior lining is crafted of 18/8 stainless steel. Designed for single-hand pouring courtesy of the brand’s signature push-button mechanism, this Euro-sleek thermos remains cool to the touch no matter how hot the contents may be. Affordably priced, the Cresimo Thermal Carafe holds around 4-ounces more than competitors’—that’s an extra half cup of liquid gold! Attractive, functional and comparatively priced. Designed to keep beverages hot for 12 hours. 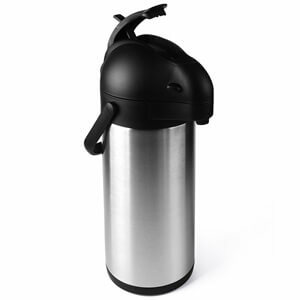 The large-mouth opening makes the Cresimo Thermal Carafe easy to clean. Comes with a 100-percent guarantee plus a 1-year warranty. If vacuum detaches, beverages may not retain heat. The pouring mechanism may malfunction. The spout could continue to drip after a pour. Air infiltration that cools contents quickly could happen if the lid is compromised. The Keurig brand has always been associated with quality and innovation thus your expectation isn’t unreasonable. Small but mighty (32-ounce capacity is half of the aforementioned Cresimo), the max amount of beverage you’ll keep hot or cold is 4 cups and you can’t use this carafe with anything other than a 2.0 system. The K2.0 is a boon for those who don’t mind making fresh pots more often than those larger capacity thermoses. Keurig fans should expect the usual complement of features that include a comfortable carafe handle, brew-through lid, and streamlined silhouette. 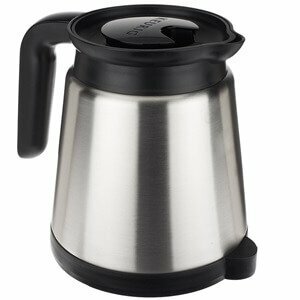 Keeps coffee piping hot for up to 30 minutes. Stainless steel construction holds up for years. Designed with a unique base that stabilizes the pot. Affordably priced and an ideal gift pick for coffee lovers who own the 2.0 system. The pot’s top is made of flimsy plastic; could break or fall off. Despite claims, heat retention issues persist. If you use large cups, you’ll only get two servings from one pot. This carafe isn’t compatible with other Keurig brewing systems. Whether you regularly gather coffee drinkers together at your home or you host meetings at the office, the ubiquitous coffee carafe usually turns out to be the star of the show as long as capacity is large enough. If insulated storage for crowds is a priority, Cresimo’s Stainless Steel Coffee Airpot should attract your attention. Given this thermos’ 101 Oz capacity, you might think keeping that much liquid hot for extended periods of time is impossible, but Cresimo says that its vacuum technology is so efficient, hot temperatures can be maintained for 12 hours. Designed with a large mouth opening that fills fast and cleans even faster, the unit’s lever is designed for single hand pumping, so you don’t have to put that cookie down to dispense a refill. Sturdy steel construction and double-wall lining retain a beverage’s original temperature. The Airpot comes with Cresimo’s signature return policy and a 1-year guarantee. Features 18/8 stainless steel construction that’s a hallmark for all Cresimo carafes. Fill with cold beverages and the product will remain condensation free. Returns concern the carafe’s inability to keep beverages hot for any length of time. Plastic parts could break even with normal use. The pumping mechanism could slow down the dispensing process, or malfunction. The 24-cup serving claim may not be accurate. If you like lots of color in your life— especially when it comes to serving pieces that reflect your style —the Vremi 51-ounce coffee carafe offers plenty of capacity to serve around 12 cups of beverage. 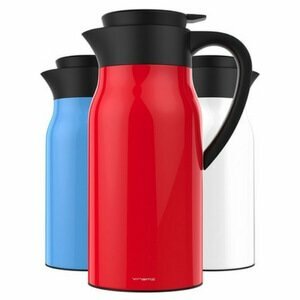 This carafe performs like products made by the iconic brand Thermos, so fill it with hot or cold beverages and expect pours to be at proper temperatures. Marketed as the most versatile thermos on the market, the manufacturer recommends this as an ideal road-trip carafe when filled with soup, coffee or tea, even if you travel for hours to reach your destination. Vremi insulated carafes may be brightly colored but they’re constructed of solid stainless steel, so you get style and temperature control. The lid is made of safe, BPA-free, food-grade plastic. Serve up to 12 cups of beverages with a single fill. This is an extremely affordable carafe in light of its design and capacity. Makes a unique wedding gift for couples who love coffee. The brand is extremely popular with millennials eager for unique styling. The user may find the thumb-operated lid difficult to attach; it could also malfunction. 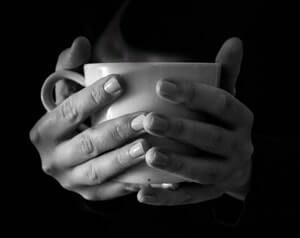 Hot beverages could become tepid in less than 30 minutes. A hissing sound could indicate permanent air leakage. The spout may continue to drip after a pour. If you’re impressed by German engineering, you could be convinced to buy this carafe. The lid has been engineered to lock precisely at the right location. Surgical-grade stainless steel promises the sort of vacuum insulation that keeps contents hot while the carafe’s exterior remains cool to the touch. Pykal insists that this thermos will retain temperature even after hours of sitting and they continually lab test to make sure that statement is accurate. Purchase your carafe directly from the company and get a 1-year warranty. During that year, enjoy the brand’s signature “press button” technology that not only keeps contents at peak temperature but Pykal claims that you won’t have to deal with leaks, drips or spills. The extra-wide top makes the filling and cleaning a breeze. Comes in a classic box for gift giving that includes a free pot cleaning brush. The large 68-ounce capacity comes with an affordable price tag. Cold beverages retain temperatures for up to 24 hours. While the handle feels comfortable, it could get too hot to touch. Leaking could happen despite top seal leak-proof claims by Pykal. May only keep beverages hot for few hours if you don’t follow exact 24-hour heat retention instruction. Carafe’s exterior tends to attract soil and requires frequent wipe-ups. Q. Where did coffee carafes originate? A. The Turks began brewing coffee in metal pots called ibriks around 575 A.D. Visit a Turkish coffee shop today and your brew will be prepared and served from a long-handled ibrik considered to be the earliest coffee carafe. Q. Who made the first contemporary insulated carafes? A. Credit usually goes to Thermos, the iconic company that pioneered double-insulation technology at the heart of all thermal products. Q. Is stainless steel or glass the best material choice for carafes? A. This is a matter of individual choice, aesthetics, and finances. Glass carafes tend to be cheaper but they also break easily, so replacement is always a consideration. Glass doesn’t retain heat for very long. Q. When are temperatures removed from the equation, which material wins? A. Euro-style glass coffee maker/carafes may be so artfully designed (e.g., Chemex), owners don’t mind risking breakage. Q. Are glass or thermal coffee carafes more environmentally friendly? A. Since glass can be recycled, doesn’t compromise taste and offers other benefits, it’s the most earth-friendly material. Q. Which carafes keep hot beverages hotter and cold beverages colder? A. Thermal coffee carafes—even when seals, lids, and levers malfunction. Not only do contents retain temperatures but aromas and flavors as well. Experts say that when coffee is exposed to air for more than 20 minutes, taste declines. Q. 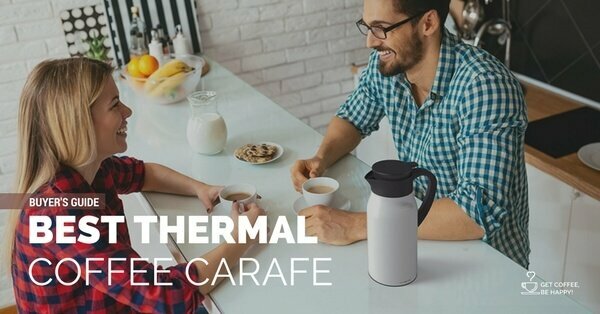 Can pre-heating an insulated carafe help with longer heat retention? A. 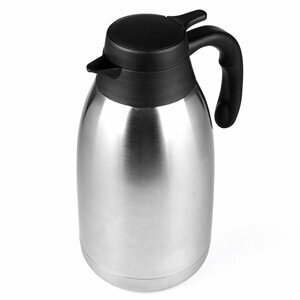 Some stainless-steel carafe owners swear that by pouring boiling water into the thermos before coffee, tea or other hot beverages are introduced, the brew stays hotter longer. Q. Which type of carafe is best for automatic dishwashers? A. Glass only. Thermal carafes are not dishwasher safe and should be hand-washed. 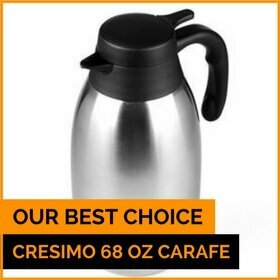 Given size differences, performance, and consumer preferences, we would be hard-pressed to recommend anything other than the Cresimo 68 Oz thermal carafe. You receive the most number of pours per pot. That 12-hour time window for keeping contents piping hot appears to be accurate. And the price won’t tap your retirement account. The Cresimo brand gets top-notch reviews from all quarters and you don’t have to buy this insulated cafe directly from the company to receive that 100-percent guarantee plus the company’s 1-year warranty. Available from myriad websites and retail stores specializing in coffee-making equipment and accessories, the Cresimo 68 Oz thermal carafe is not meant for those who grow bored of their appliances. You’re going to have this thermos around to brew your favorite liquid guilty pleasure for many years to come! Did you like my Best Coffee Carafee Guide? The Top List of Insulated Coffee Carafes is reviewed by a true Italian Espresso Lover. 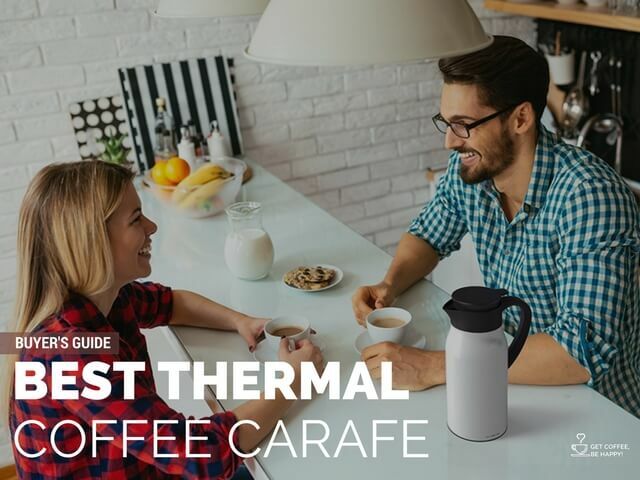 Choose any from this list of Best Thermal Coffee Carafe 2019.